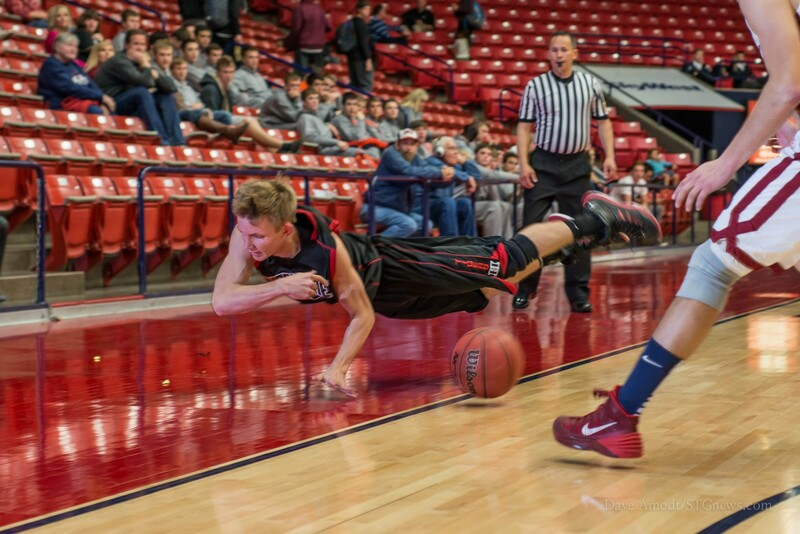 ST. GEORGE — James Bennion’s 3-pointer from the baseline was straight on line, but caromed hard off the front rim and bounced harmlessly away, leaving Hurricane just inches short of victory Friday afternoon at Dixie State’s Burns Arena. Seconds earlier, North Sevier’s Landry Nelson hit a driving layup that ended being the game winner as the Wolves defeated the Tigers 52-50 on the second day of the Red Rock Rumble. After an 0-5 start to the season, the Tigers have been playing pretty well, defeating Dixie and Manti Wednesday and Thursday. They started well enough Friday, too. Hurricane opened the contest with 10 straight points and it was nearly four minutes before Kyler Bosshardt finally got on the board to make it 10-2. Kaden Langston had a trey and Cody LeBaron, Austen Beatty and Erik Mitchell each baskets in the opening run for Hurricane. But the Wolves weren’t bothered by the slow start and actually outscored Hurricane 14-4 the rest of the quarter to tie it at 14-14 after one. Fisher Anderson’s 3-pointer in the closing seconds provided the tying points. North Sevier continued the hot play into the second quarter. With Hurricane ahead 21-20, point guard Trevor Okerlund started hitting shots. His eight second quarter points helped the Wolves forge ahead 32-25 at the half. North Sevier kept the Tigers at bay most of the third quarter, even extending the lead to 39-30 with 90 seconds to go in the third. That’s when the 3-pointers finally started falling for Hurricane. After buckets by LeBaron and Jordan Ence, Bosshardt scored to make it 41-34. That’s when Bennion got hot, hitting consecutive treys after NSHS turnovers to make it 41-40 heading into the fourth quarter. Bennion hit his third trey in a two-minute span to give the Tigers a 43-41 lead early in the fourth quarter. LeBaron followed that with a hard-charghing layup to make it 45-41 and lit looked like the Tigers were going to take over the game. However, Anderson’s second trey of the game made it 45-44 and the race was on. Mitchell hit a 3-pointer that helped Hurricane back to a six-point lead with four minutes left at 50-44, but the Wolves busted out a half-court trap defense that forced three straight turnovers, all leading to baskets at the other end and the game was tied at 50-50 with just under two minutes to play. With 94 seconds left, LeBaron tried to give the Tigers the lead, but missed a wild shot in heavy traffic in the lane. North Sevier then ran the clock down and tried for a last shot, but it was missed by Okerlund. He got his own miss and was blocked on the putback try by Beatty. But the long rebound was picked off by Nelson, who drove to the basket and scored with 4.8 seconds to play. After a quick foul (NSHS had one to give) and a couple of timeouts, Langston drove past half court and dished to Bennion. The junior guard had made four treys in the game, but this one would come up short as the buzzer sounded. Hurricane, which falls to 2-6, was led by Bennion’s 14 points, while Kaden Langston added 11 and LeBaron had 10. The Tigers conclude their Red Rock Rumble experience Saturday at DSU with a battle against Mountain Crest at the Old Gymnasium. Tipoff is set for 11:45 a.m. After that, the Tigers don’t play again until Jan. 3 at Virgin Valley. 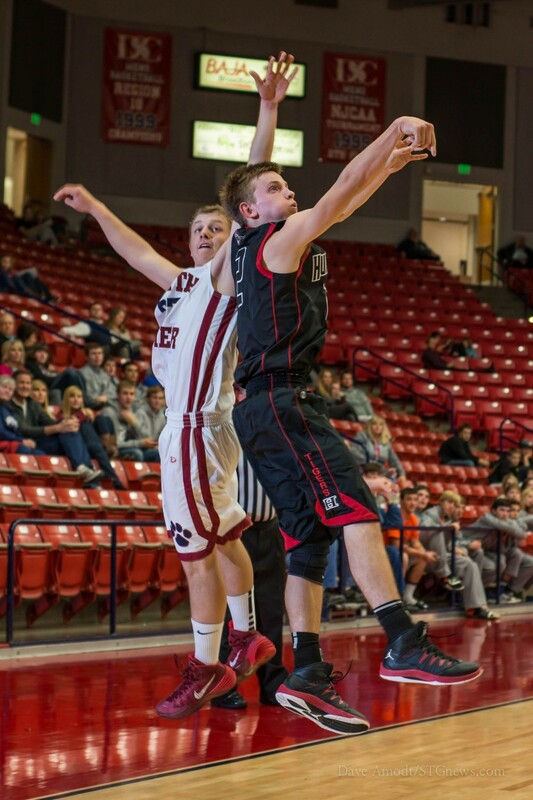 North Sevier, 3-5, was led by Anderson’s 20 points and Okerlund chipped in 8. The Wolves battles Dixie Saturday night at 6:45 in Burns Arena.